After our short stop at Ipoh, we headed for Kuala Lumpur (KL) this morning by bus. At midday, we'd arrived at the capital city and were waiting by the meeting point at Puduraya bus station. But strangely enough, we weren't waiting for a taxi to transport ourselves and all our belongings to a guesthouse, as would be our normal routine on arrival. No, today we were waiting for a lift from my Uncle Gary. We'd arranged to meet him and my Auntie Anita (my mum's sister) some time ago. Since my aunt was working during the day, the plan was for Gary to pick us up from the bus station and take us back to their house in Petaling Jaya - a suburb of KL. As we waited at the rank, I was wondering whether I'd be able to recognise Gary again after all these years (the last time I saw him was in 1987). Fortunately, and surprisingly, he hadn't changed much at all. I could still recognise him; it was probably more difficult the other way around as I was only a kid when he last saw me. Gary is a Malaysian Chinese who has been living in Malaysia all his life - if you exclude the time he spent in the UK, studying in Sheffield. Then marrying my aunt, working in Hong Kong and Singapore before settling back in Malaysia again. Like most Malaysian Chinese, his English is excellent and Ian was chatting along quite happily within seconds of meeting him. Up until that point, I had been worrying that Ian may feel excluded due to language barriers. But it was apparent that this was not going to be the case. Like Ian, Gary could talk the hind legs off a donkey. After a quick bite to eat, we headed back to the house where we were introduced to their three big dogs: - Rocko (Rottweiler-Alsation cross), Becky (Rottweiler) and Marlbo (Boxer-Bull Mastiff cross). The last one was named after my uncle's favourite brand of cigarettes (an abridged version, that is!) before he quit the habit three years ago! Rocko was limping around a bit but wagging her tail enthusiastically all the same. I put this down to nervous-excitement but was later told that she had been chasing cats away from the garden all morning and must have pulled a muscle. The dogs were great - it took a while for them to warm to us but we got there in the end. Later in the afternoon, Gary took us to Bandar Utama Shopping Mall in Petaling Jaya for a coffee break. Since Starbucks offers free Wi-Fi Internet access, both my uncle and Ian were sat with their laptops open, making the most of the free surf. I'd tune in occasionally but spent most of the time reading guidebooks to find out what there is to see and do in KL. For a moment, we must have looked studious sitting in a corner, deep in concentration and nursing mugs of coffee in our hands. Time was moving on and 6.30pm came around fast. We'd been enjoying ourselves so much that we didn't even notice the time. It was time to pick up my auntie from work and go out for dinner. My auntie hadn't changed much either but then, I'd seen her many times since 1987. My uncle and auntie treated us to dinner at a place called 'Momo', a Japanese buffet restaurant. We talked the night away over sushi, miso soup and various raw and cooked seafood and meats. Occasionally, I'd translate conversations between my aunt (she doesn't speak much English) and Ian. Ian would utter the odd Cantonese word that I'd taught him over the years (mainly snippets of words I'd say to my Cantonese-understanding Chihuahua - he's bilingual actually! ), and my aunt would beam a smile not too dissimilar to a Cheshire cat. After dinner, Gary and Anita drove us into KL to see the Petronus Towers by night. They looked lovely lit up, as did the KL Tower whose floodlights changed colour every now and then. 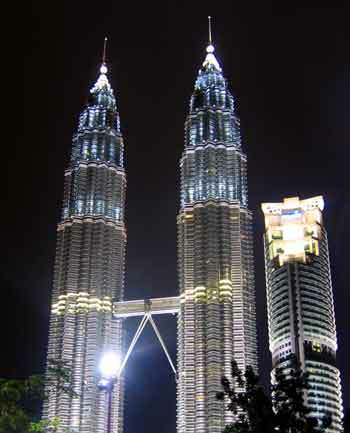 The Petronus Towers sparkling against the night sky. The building next door looks like the cheeky youngster who wants to barge in on a photo. "Look at me too! Look at me!" The night was still young though and we headed for a bar called 'Nest', Gary's local, judging by the number of people who knew him on a first-name basis (incidentally, that included all the bar staff!). By the time we got home, it was gone midnight. The day's events had taken their toll on me so I crashed out. But the fun continued downstairs with more beer in the fridge and DVD movies on play. We all had a wonderful day and it looked like Ian had met his match with my uncle, not just in terms of non-stop cheery banter but in the beer consumption stakes! I think that fridge downstairs needs re-stocking soon!